That strat rhythms sound great. When they say that it will sound good after a wah they mean after a buffer? I´ve got a ge/ge "fuzzy lady" that sound gorgeous, awful after buffers of course... That´s what have been stopping me building those sweet sounding germanium layouts. oop. copy and paste error. can't believe i forgot to change that. fixed now. Ha. Just ask scotty. From what I hear you were lucky 2 receive one of his pedals back in the day. Hopefully his new ones being sold by distributors, Will restore his reputation. Cause he's one of the best. I buy his originals whenever I get the chance. That said, Q3 Shoot for 65hfe hi leakage. Q1 and 2, 50 to 60 no leak. Yes sir. I actually still sell direct thru eBay and yes, I am slowly restoring my reputation once my new model of original fuzzes are out. It's a slow process in getting to make amends as Rome wasn't built in a day ya know. The people who I have on my list to get pedals to all have been terrific and very nice and understanding. I'm grateful for the opportunity to be able to restore ProAnalog Devices to a level of reputation as an original professional guitar effects company that is product and customer focused. That's awesome. You and mr. main are my 2 favorite builders of all time. Genius. My mk3 you built, is like my wife. What's the diode in the original actually for? Is that a 100uf box cap to the left of Q2 or should that be 100nf ? correct. i also caught an error. that cap should actually connect the Collector of Q1 to the Base of Q2. layout has been corrected. Two quick questions: 1. Anyone have a link to the schem? I can post the one I drew but mine doesn't cleanup all that well. Has anyone who's built this from the layout above been able to achieve similar vol cleanup as in the clips? This layout is verified as well. So you can build without concern. Awesome thanks. Time to buy more transistors. If I use NPN and apply the voltage properly would you expect similar results? the short answer is maybe. if you're going to switch the transistors from PNP to NPN you're going to need to reverse the electrolytics. as far as tone goes the tone will change base on the transistors you're going to use. this holds true for even trying different PNP transistors, as each type has their own tone/sound. you're also going to want to make sure that the transistors you use are in the right gain ranges and leakage to sound and bias correctly. for tonebenders you want to make sure Q3 has a good amount of leakage, while Q1 & Q2 you want a little as possible. 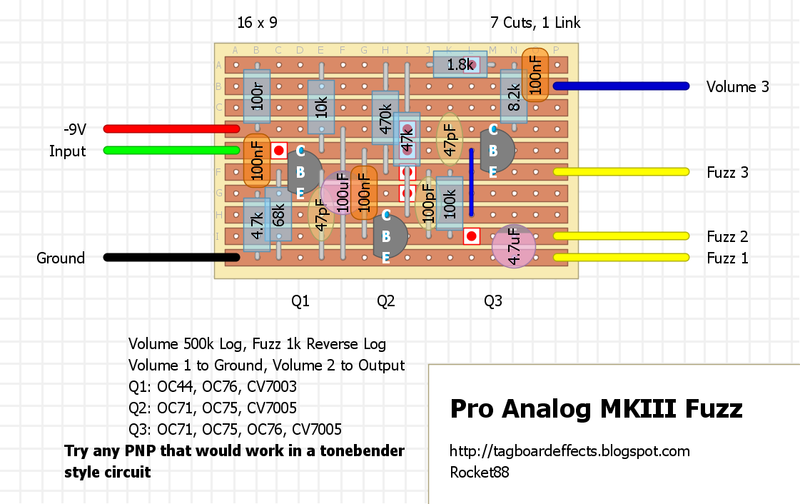 That leakage guideline applies to the MKIII (3 knob tone bender) where Q1 and Q2 are used in a Darlington pair. This is called "MKIII" but is actually a slightly modified MKII, so approach it as you would a MKII. Hello, i build it, but it doesnt work. I only get a clean (unfuzzed) Sound. The volumenpoti works. It seems that the fuzzpoti doesnt work. Any Ideas? I used AC125 at Q1, 2,3. You and mr. primary are my 2 favored building contractors of all time. Exactly what's the diode in the original really for? I've tried building this one twice and both times I've encountered the same problem. 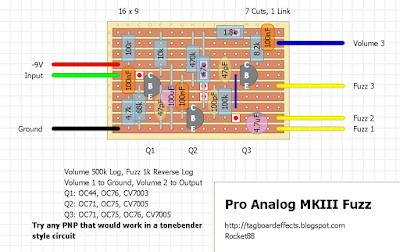 With the fuzz pot turned all the way down, the circuit sounds great. A smooth warm drive/fuzz. But as I increase the amount of fuzz, I get oscillation. It starts oscillating once I turn up the fuzz past say 25%. Any ideas? Is this a bias issue? Love to get some insight into how to troubleshoot this one. Thanks!